The lights may have been switched off on crime MMOG APB, but sources suggest that Epic may be switching them back on again. Beleaguered MMOG APB may have found a last-minute lifeline if rumors that Gear of War creators Epic Games want to buy the rights to the game are true. According to sources close to APB's development team, a number of companies are being approached by administrators with a view to buying the IP, and Epic has been mentioned as a potential buyer. 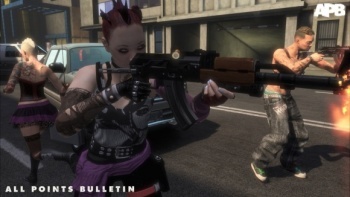 The BBC's Johnny Minkley said that Epic had created the engine that APB ran on, and so would have little trouble getting it up and running again, but added that he wasn't sure whether the potential gain from reviving the game would be worth the effort. Dana Cowley, Epic's senior public relations manager, didn't directly deny the rumors and said that Mark Rein - Epic co-founder and vice president - had loved what he seen of the game. She suggested that Epic was too busy to take on APB however, saying that the company had its hands full with Gear of War 3, Bullet Storm and Project Sword, but added that any talks on the matter would be confidential anyway. According to Eurogamer, Dave Jones - founder of the Realtime Worlds, the studio that made APB - is good friends with Rein, but whether that friendship extends to bailing out the closest thing that MMOGs have to the Titanic remains to be seen. It's possible that Epic might buy the IP, but decide to do something else with it, rather than restart the MMOG. As with all rumor, we'll just have to wait and see what happens.